Showing off my new flat Roman shades is what I hoped to post last week, but due to other priorities, that was not possible. I’m happy to report one of my two Roman shades is finished! Underestimating the time needed to complete any DIY project is definitely a problem for me. Even when I’m trying to be very realistic, I tend to be way off. I thought I could get two shades finished in one week. Well, it looks like I can only get one done in that period of time! As mentioned in this post, these shades are for function and beauty. The dining room window faces west, and the sun in the spring and summer is brutal for the lucky people seated facing the window. The sunshine is downright blinding. 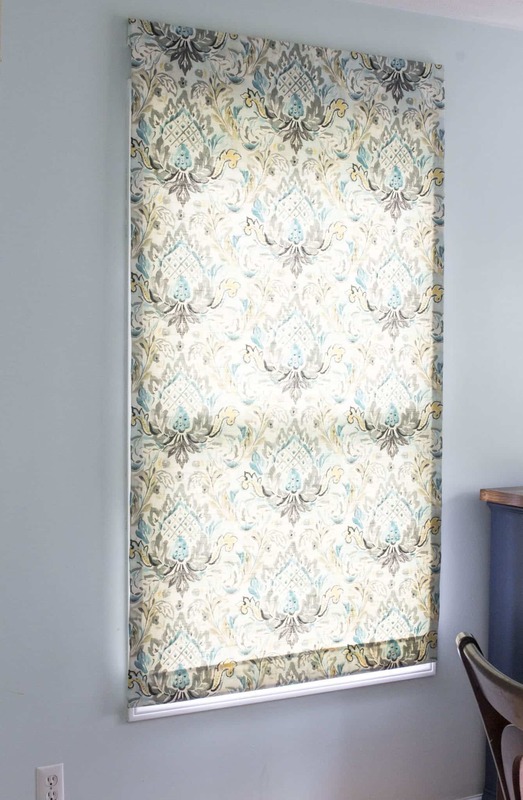 For that reason, oh and privacy and needing window treatments in general, I decided to make a flat Roman shade for this window and the corresponding window in the living room. The dining room is not a room I’ve shared on the blog yet, mostly because so much of it is incomplete. Maybe this summer I’ll finish it? Here is a look at my naked window. This poor window has looked like this for five whole years. Five! I’ve never put any curtains, shade, or blinds on it; I guess you get used to things and they seem normal after a while. Right? And now looking much more finished! The folds have not been trained yet, so those will be flatter and more even in time, but I’m so happy with how it turned out! Window treatments add so much to a window and room! As I’m typing this, I keep peaking over at the dining room window to check out the view, and it looks good! Even though the shade is fully operational, it will be open most of the day and likely night. It will only be closed to hide that blasting evening sun during dinner time. Although perhaps we will start shutting the shade at night. We’ve lived with bare, open windows for so long, I don’t know that I’ll remember to shut them at night! Do you shut your curtains/shades every night? I leave everything wide open on our main floor. Am I the odd ball here? 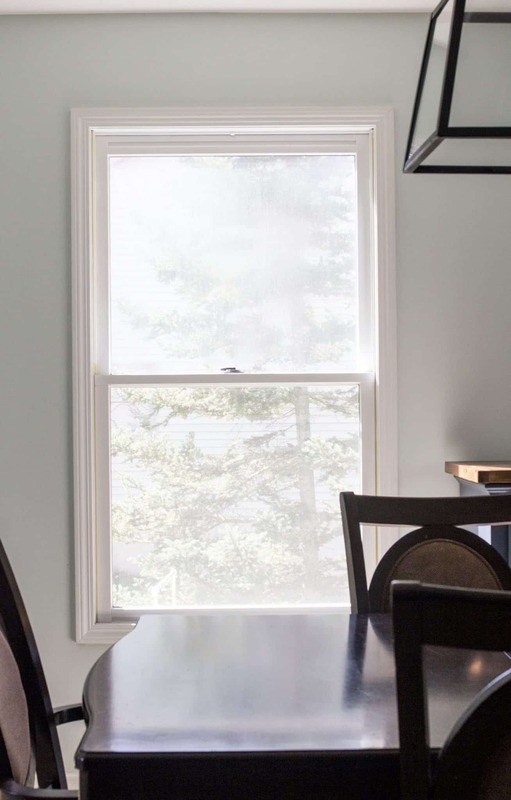 To optimize the light from this large window and to match the height of the curtains over the sliding door also in this room, I opted for an outside mount and hung it about 6 inches above the window trim. 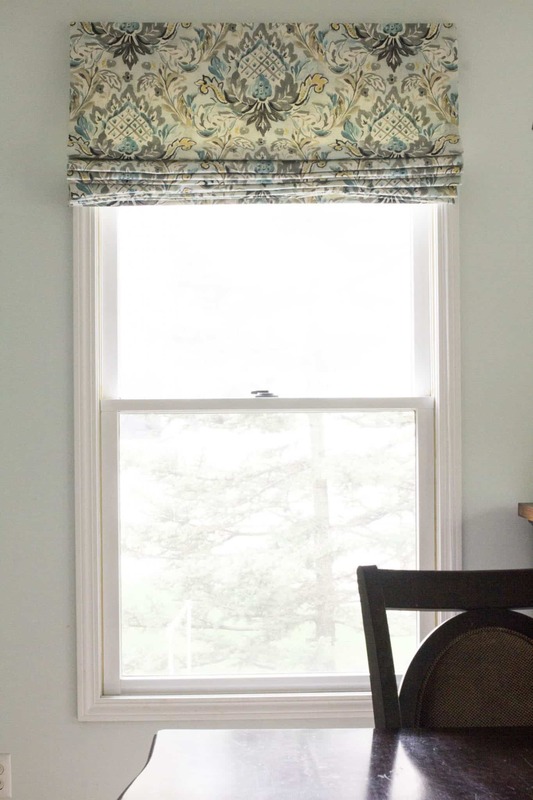 Hanging window treatments higher and wider than your windows is always a good idea though. It helps the windows look larger and blocks less light when the shades are open, and it tricks the eye into seeing uniformity between all the windows and doors in a room, even if they are all different heights. 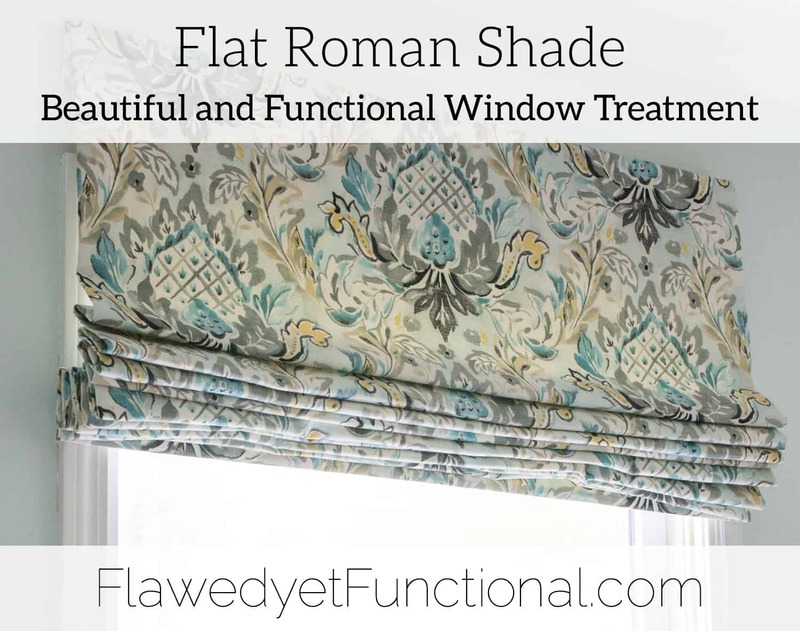 For the most part, these flat Roman shades are straightforward to make. It’s just a rectangle with rings attached, no pleats or anything fancy to factor in. However, it challenged my ability to draw a straight line. 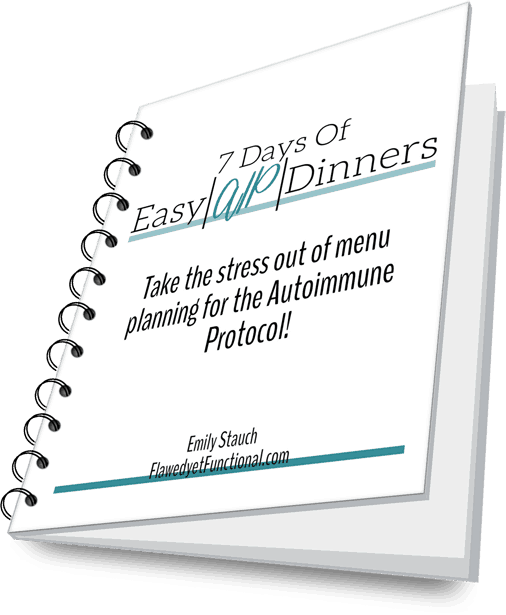 Who knew it could be so difficult? I drew the rectangle for the face fabric at least 3 times, and I don’t mean a tweak here or there 3 times, erasing-the-whole-thing-and-starting-all-over 3 times. Dan finally helped me see the pattern was printed on the fabric crooked. Ah! Sanity restored! I’m planning to share a tutorial once I get the other shade done, and I think a bit on how to draw a straight line might be helpful. Anyone else struggle with this? Am I alone in this struggle? One more house project, done! One step closer to a more finished, functional, and beautiful home. 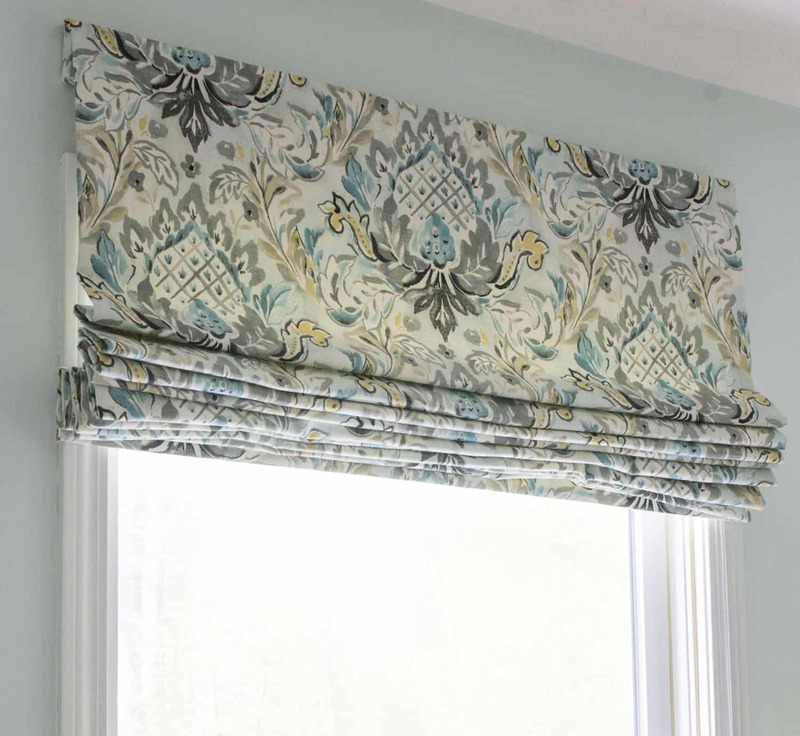 Flat Roman shades are a relatively easy DIY project to add color and interest to your room. They block the sun, provide privacy, and add a structured splash of color to liven up your home. What beauty and function have you added to your home lately, DIY or not? Do you have any Roman shades in your home? Love them or leave them?